Monitoring of clients' satisfaction is an essence or one of the goals of quality assurance in the services of the medical laboratory. Quality control measures ensure that all the processes in the histopathology laboratory conform to acceptable standards, from the accessioning of specimens to the delivery of histopathology reports to the physicians in the clinics and wards. Surveys have been indispensable tools employed by manufacturers and health institutions to meet challenges of market competition and maintenance of standard. The patient is the primary client of services in hospitals and thus has been the focus of researches aimed at the quality of health-care delivery. In Nigeria, most of the papers published on this subject centered on patients' satisfaction with care in the hospitals including the quality of interaction with their doctors and therapeutic outcomes.,, Few papers have addressed the peculiar nature of pathology services in which the primary consumer is not the patient but the clinician who requested for the service., In the practice of surgical pathology, a request for the analysis of a specimen is made to a pathologist by a physician (or surgeon) who expects the results to be communicated back directly for therapeutic decisions to be made. This categorizes the clinician as the primary client and consumer of histopathology service. Measurement of the extent to which the surgical pathology reports meet the expectations of the clinician on vital aspects/quality assurance such as accuracy, content, and turnaround time (TAT) is a valid method of judging and monitoring the quality of the laboratory/histopathology service. The Q-Probes, a potent tool for laboratory quality monitoring, was developed by the College of American Pathologists and have proved successful in ensuring that laboratories in America maintain standards and become customer oriented. The effectiveness of the Q-probes was captured in numerous papers published in institutions in America and has manifested in increased quality of services. Such a tool is yet to be developed and implemented in Nigeria. Information generated from such kind of surveys will immensely support laboratory administrators in planning and developing policy and quality management systems., Quality management schemes when seamlessly woven into the intricate working of the laboratory daily routine ensure that accurate, complete, and timely reports are delivered to the physicians for effective patient care. Searches conducted on medical databases suggest a gap in the literature on assessment of physician satisfaction with surgical pathology services in the health institutions in Sub-Saharan Africa. This research was undertaken to determine the levels of the clinicians'/surgeons' customer satisfaction with histopathology services bearing in mind that such survey is an important tool to identify the strength and weakness of the services and provide more insight into the needs of the clients. This was a quantitative cross-sectional study to determine the level of satisfaction of physicians with histopathology services offered in the hospitals in various regions of Nigeria. The target population consisted of doctors in tertiary health institutions which have on-site pathology laboratories. Questionnaires were distributed to physicians in six randomly selected health institutions located in the South-south, South-east, and North-central regions of Nigeria. These institutions included (1) Benue State University Teaching Hospital, Makurdi, (2) University of Calabar Teaching Hospital, Calabar, (3) Jos University Teaching Hospital, Jos, (4) Bingham University Teaching Hospital, Jos, (5) Kaduna State University Teaching Hospital, Kaduna, and (6) Federal Medical Centre, Umuahia. The contents of each questionnaire consisted of nine items divided into two sections. The first section sought the opinions of respondents on five quality assurance variables in terms of the overall satisfaction with histopathology services, laboratory report accuracy, report completeness, report timeliness, and ease of access to a pathologist. Responses were graded on a Likert-like scale (very satisfied, satisfied, undecided, dissatisfied, and very dissatisfied), and respondents were asked to tick on the appropriate spaces provided. In the second section of the questionnaire, the respondents were required to provide information on their gender, age, specialty and professional status. Statistical analysis included descriptive analysis of demographic information to determine the age, gender, and professional status of respondents. The level of satisfaction was rated 1–5 on the five-point Likert scale as follows: very satisfied (5), satisfied (4), undecided (3), dissatisfied (2), and very dissatisfied (1). The rating points were calculated as the sum of scores multiplied by the number of respondents in each level of satisfaction, divided by the total number of respondents. Satisfaction rate (SR) was calculated as the proportion of the total responses (TR) that were very satisfactory (VS) or satisfactory (S), expressed as a percentage ([VS + S]/TR × 100). This was used to assess the responses from the four major specialties. The confidentiality of the respondents was strictly maintained, and ethical approval was received from the Research Ethics Committee of the Benue State University Teaching Hospital. A total of 251 completed questionnaires were returned and used for the analysis. There were 197 males and 50 females while four respondents opted to conceal their genders. The nondisclosure of gender was not considered an exclusion criterion. The respondents consisted of clinicians cutting across various professional ranks including house officers (36), general practice doctors (11), resident doctors (128), and consultants (72). The age brackets of the respondents consisted of 20–29 years, 43 (17.3%); 30–39 years, 129 (51.8%); 40–49 years, 63 (25.3%); and 50–59 years, 14 (5.6%). Two respondents declined to give information on their ages. The participants gave total of 1198 responses [Table 1], expressing that their opinions about the elements of quality assurance evaluated as: very satisfied, 54 (4.5%); satisfied, 580 (48.4%); undecided, 290 (24.2%); dissatisfied, 236 (19.7%); and very dissatisfied, 38 (3.2%). The mean satisfaction score using the scores on the five-point Likert-like scale was 3.2 points [Figure 1]. Seventeen participants declined to disclose their areas of specialty. These consisted of 7 resident doctors, 5 consultants, and 2 general practitioners. Three of them did not disclose both specialty and rank. Therefore, responses from 234 respondents were used to compute SR obtained from the clinical specialties. There was an overall SR of 52.9 in this study. The SR obtained from respondents in the four major clinical specialties is presented on [Table 2]. This shows that surgeons (n = 79/234) were mostly contented with histopathology services (19.2 SR). This was followed by responses from obstetrics and gynecology (15.2 SR), and the least satisfactory responses emanated from pediatrics (7.3 SR). In other words, the doctors in the surgical specialties were more contented than those in other specialties. The proportions of the 634 “very satisfied” or “satisfied” responses of the physicians concerning the elements of quality monitors are shown in [Table 3]. The frequency of the responses is ranked in descending order on the table. Respondents were most satisfied with report accuracy (26.7%) and least satisfied with TAT (12.8%). One-way analysis of variance revealed that there is no significant difference in the influence of the clinical specialty of a physician customer and the level of satisfaction with the aspect histopathology service evaluated (α = 0.05, df = 3, F = 0.1713, P = 0.9158). Responses from family medicine were not used in this analysis because of the small size. There was a section on the questionnaire for participants to provide comments and suggest recommendations for improvement of quality of surgical pathology services in their institutions. This section was filled by 25 of the participants. Thirteen (52%) of them expressed concerns about TAT, 5 (20%) suggested frequent use of immunohistochemistry to improve diagnostic accuracy, and 3 (12%) advocated regular interactions with pathologists using forums such as clinicopathologic conferences. Others recommended intensification of efforts to check any mix-up of specimens and reports (1, 4%) and further studies (3, 12%). Quality improvement monitoring activities in a histopathology laboratory include evaluation of specimen reception, accessioning, handling, processing, interpretation, and transcription for errors. Errors are often impossible to eliminate completely in any system. Most investigators agree that a significant error rate in surgical pathology is in the range of 0.5% to 1%. Quality assurance monitoring embraces all efforts to minimize errors in practice. The definitions of quality generally encompass levels of excellence, conformity to specifications, and meeting or exceeding customers' expectations. In surgical pathology, the important elements of quality include report accuracy, report timeliness, and report completeness. Since customer satisfaction is an important aspect of quality, one reliable measure of quality in pathology is to assess physicians' satisfaction with reports emanating from the laboratory. This is a logical form of external audit based on the philosophy that an objective appraisal of the service (specimen processing and interpretation) requires the examination of the product (laboratory report) by the customer. The physician is primarily the direct consumer of the services of the surgical pathology laboratory and therefore must be the focus of surveys on customer satisfaction. It opens the portal for physicians to clearly articulate expectations on quality needs. This study recorded 3.3 points on the Likert scale, and 19.7% of the 634 combined satisfactory responses were for overall satisfaction. A survey of patients' satisfaction with laboratory services in Ethiopia, 87.6% (n = 429), expressed overall satisfaction with the laboratory services. The 3.45 ± 0.85 mean satisfaction rating of this study is higher than 3.3 observed in our study. Nakhleh et al. and Jones et al. recorded 4.57 and 4.1 (n = 4329), respectively., The implication of this to the practice of pathology in Nigeria is that more efforts need to be made to identify and proficiently answer the diagnostic questions of cases as well as step up the efficiency of the laboratory services. The information provided on the requisition forms such as diagnostic questions and clinical details are important to direct the pathologist on the features to identify on the microscope slide and report. An accurate report may not necessarily satisfy the expectations of the physicians. Most of the “satisfied” or “very satisfied” responses (26.7%, n = 634) in this study are related to the accuracy of the pathology reports. The employment of synoptic checklists improves the accuracy of reports. An accurate report from the pathology laboratory must be delivered to the physician in a timely manner to be useful for patient care decision-making, and monitoring of TAT is one of the key monitors of quality. Unfortunately, report timeliness received the least satisfactory responses in our study, with 12.8% (n = 634) responses and 2.7 rating points. Although this is a one-time evaluation of perspectives, it is an indicator of the poor rating of laboratory TATs. In Kano, there was a client rating of TAT as below average by 18.4%, average by 57.5%, good by 20.7%, and 3.4% of 100 respondents in a survey. Jones et al., in a study of 4329 participants from the United States, Australia, Singapore, and Spain, reported a turnaround rating of 75%–89.9%. While laboratories drive hard to shorten TAT, it is equally poor practice to heighten expectations of clinicians by giving promises of unrealistic TATs. This is a form of poor communication likely to yield poor SRs. Laboratories may have domestic challenges and TAT information for large, small specimens, and those needing additional procedures such as calcification should be communicated to the physicians who consult the services of the laboratory. A review of 2125 cancer reports, by Idowu et al., concluded that about 30% of cancer reports do not contain the scientifically validated elements. 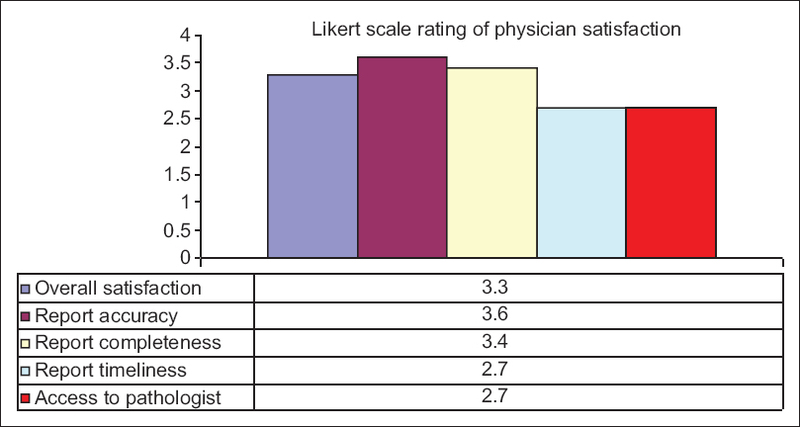 In the survey of levels of satisfaction of physician customers of 74 laboratories by Nakhleh et al. in 2 years, report completeness scored 4.62 and 4.65 on the Likert scale in the years 2004 and 2005, respectively. These figures are higher than 3.4 obtained for satisfaction with completeness of the laboratory reports in our study. The anatomical pathology report is expected to bear the patients' demographic or identification characteristics, clinical details provided on requisition, specimen grossing, and microscopy observations, presented in a clear concise format. Information on extent of invasion and the status of invasion margins of malignant neoplasms are often missing in reports eliciting dissatisfaction from physicians. Although the narrative reporting is still the popular practice in most pathology laboratories in Nigeria, the use of synoptic checklists has been demonstrated repeatedly to be a superior format., The authors of this work advocate repeated discussions among pathologists in Nigeria on the challenges of adoption, adaptation, and implementation of standardized synoptic reporting using checklists, especially when examining malignant tumors. The use of a checklist ensures that the relevant tumor characteristics are mandatorily sought for and documented. It minimizes subjectivity inherent in descriptive reports and ensures consistency of diagnostic criteria, completeness of specimen information, and improves accessibility to information for clinical decisions and research. Errors may occur at any phase of tissue processing and undermine the usefulness of the reports for diagnostic or therapeutic decisions or lead to unwarranted delays. Error must be monitored to satisfy the expectations of physician customers. Although there is a dearth of literature on the documentation and analysis of errors associated with surgical pathology in Nigeria, there are ample literatures from elsewhere which can be employed and adapted to improve the quality of practice. This does not, however, obviate the necessity of accurate documentation of errors in our laboratories. The literatures on medical practice errors indicate that communication mishaps are the most injurious to patient care. This also applies to the practice of histopathology., Communication quality encompasses all activities involved in transmitting vital information to the clinician and receiving feedback. There has to be an assurance that the information transferred is received and understood and that it has met the expectations of the consulting physician. In instances where clarifications are sought, there should be effortless access to the pathologist who interpreted the microscope sections and wrote the report. Unfortunately, only a small proportion of the respondents in this study were satisfied with the ease of access to a pathologist. Out of the 634 “satisfied” or “very satisfied” responses, 118 (18.6%) were favorable to ease of access to a pathologist, and this represents 9.8% of TR (n = 1198). Although the requisition forms and the pathology report are the main instruments of communication between the clinician and the pathologist, it is imperative, especially in the light of these findings, that other portals be explored and developed by individual laboratories. Such meaningful and mutually beneficial channels include clinicopathologic meetings, consensus meetings between pathologists to discuss difficult cases, E-mails, and myriads of internet applications currently available. Security of the novel portals must be ensured because maintenance of confidentiality of patient data is also a mandatory ethical requirement of quality management. The result of this study is a documentation of the perceptions of the physician customers at the very moment of completing the questionnaires and assumed to be truly representative of their feelings about the services they have generally received all through their practice. Familiarity with the services of the laboratory in their practice centers or pathologists might have influenced their opinions. Furthermore, there are no templates or benchmarks provided for them to weigh their judgments against. A more objective approach may be to obtain satisfaction report on each histopathology report dispatched from the laboratory and collate the reports periodically. Such a survey, in the future, will also have the added advantage of specifically targeting the surgeons and gynecologists who are the major consumers of this service and document their perceptions. It may also be rewarding to conduct temporal assessments of customer satisfaction levels and use the results to determine quality improvement needs periodically. This paper advocates inclusion of customer satisfaction survey reports as an essential requirement for accreditation of laboratories by the regulatory or training bodies such as the Medical and Dental Council of Nigeria and the National Postgraduate Medical College of Nigeria. This has the benefits of indirectly recruiting the perceptions of the physician customers into the laboratory quality monitoring process. It will also bring to fore the awareness that hospital administrators are accountable for the quality of services rendered in the hospital laboratories as well as provide a thrust to achieve preset benchmark goals. This was a cross-sectional survey of levels of physician's satisfaction with histopathology services in different hospitals in Nigeria. The results of this study suggest that even though most physicians expressed satisfaction with the accuracy of reports, there remains a low level of satisfaction with the TAT of specimens submitted in the various laboratories. Creswell J. Research Design: Qualitative, Quantitative and Mixed Methods Approaches. Los Angeles, CA: Sage Publishers; 2009. Iliyasu Z, Abubakar IS, Abubakar S, Lawan UM, Gajida AU. Patients' satisfaction with services obtained from Aminu Kano Teaching Hospital, Northern Nigeria. Niger J Clin Pract 2010;13:371-8. Abioye Kuteyi EA, Bello IS, Olaleye TM, Ayeni IO, Amedi MI. Determinants of patient satisfaction with physician interaction: A cross-sectional survey at the Obafemi Awolowo University Health Centre, Ile-Ife, Nigeria. South Afr Fam Pract 2010;52:557-62. Okokon IB, Ogbonna UK. The consultation in primary care: Physician attributes that influence patients' satisfaction in Calabar, Nigeria J Gen Pract 2013;2:135. Atanda AT, Yusuf I, Haruna MS. Perceived and real histopathology turnaround time: A Teaching hospital experience. Niger J Surg 2017;23:98-101. Nakhleh RE, Souers R, Ruby SG. Physician satisfaction with surgical pathology reports: A 2-year college of American pathologists Q-tracks study. Arch Pathol Lab Med 2008;132:1719-22. Zarbo RJ. Determining customer satisfaction in anatomic pathology. Arch Pathol Lab Med 2006;130:645-9. Nakhleh RE. Introduction. In: Nakhleh RE, Fitzgibbons PL, editors. Quality Management in an Anatomical Pathology: Promoting Patient Safety Through Systems Improvement and Error Reduction. Northfield: The College of American Pathologists; 2005. p. 1-4. Teklemariam Z, Mekonnen A, Kedir H, Kabew G. Clients and clinician satisfaction with laboratory services at selected government hospitals in eastern Ethiopia. BMC Res Notes 2013;6:15. Jones BA, Bekeris LG, Nakhleh RE, Walsh MK, Valenstein PN; College of American Pathologists, et al. Physician satisfaction with clinical laboratory services: A College of American pathologists Q-probes study of 138 institutions. Arch Pathol Lab Med 2009;133:38-43. Idowu MO, Bekeris LG, Raab S, Ruby SG, Nakhleh RE. Adequacy of surgical pathology reporting of cancer: A College of American pathologists Q-probes study of 86 institutions. Arch Pathol Lab Med 2010;134:969-74. Lankshear L, Srigley J, McGowan T, Yurcan M, Sawka C. Standardized synoptic cancer pathology reports: So what and who cares? A population based satisfaction survey of 970 pathologists, surgeons and oncologist. Arch Pathol Lab Med 2013;65-72. Nakhleh RE. Patient safety and error reduction in surgical pathology. Arch Pathol Lab Med 2008;132:181-5. Kornstein MJ, Byrne SP. The medicolegal aspect of error in pathology: A search of jury verdicts and settlements. Arch Pathol Lab Med 2007;131:615-8.